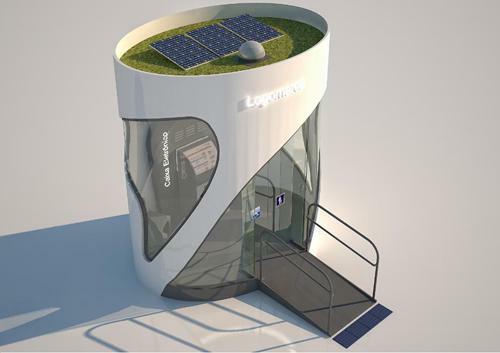 Edra Equipamentos (Ipeúna, Brazil) reports that it has developed a product an ATM booth that uses environmentally friendly raw materials and alternative energy sources to create a structure unique in the banking industry. The floor is also sustainable: the plastic wood comprises more than 90 percent of discarded packaging waste. To reduce the energy consumption of the booth, Edra Equipamentos opted for use of solar photovoltaic panels, which power LED lamps, more powerful and economical. “However, during the day, the natural lighting is provided by a system called Solatube, which captures and diffuses the light in the environment.” Further, the use of special films manufactured by 3M (St. Paul, Minn., USA) helped to reduce the need for energy to cool down the booth, preventing the passage of more than 80 percent of infrared rays. Another novelty proposed by the Contemporary Bank Project is the “green roof.” With the installation of a collector of rainwater at the top, it is possible to grow plant covers. “Besides the aesthetic gains, this alternative improves the thermal and acoustic comfort of the users.” The booth can also be provided with several environmentally friendly accessories, such as trash bins made from natural fibers and architectural details produced with reused glass. Large-scale manufacturing is expected to begin in June.